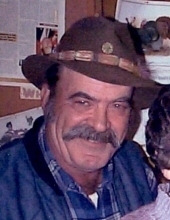 Celebrating the life of Frederick I. Smith Jr.
Obituary for Frederick I. Smith Jr.
LANCASTER – Frederick I. Smith Jr., 74, of passed away in his sleep the morning of February 6th, 2019. He was born on September 19, 1944 the son of Frederick I Smith Sr. and Marion (Scott) Smith. On March 21, 1965 he married the love of his life Kathleen (Lee) Smith. Fred worked at Timberland Machines, Temple Construction, Audley Construction and later in his life at White Mountain Regional High School. He was and avid hunter, fisherman, woodworker and Earnhardt fan. He was very well known for his singing and guitar playing. Fred looked forward to his NY hunting camp trips as well as spending time with family at camp on Haystack Mountain. He enjoyed spending time with grandchildren and great-grandchildren with whom he couldn’t get enough of. He leaves behind his wife Kath of 54 years; a son Jeffrey E. Smith Sr (Ina) of Lancaster; a daughter Lisa A. Hampton (Nathan) of Vermont; 5 grandchildren, Bryan Gooden (Megan) of Whitefield, Stephanie Gooden Wallace (Larry) of Jacksonville, FL; Jeffrey E. Smith Jr of San Angelo, TX, Christopher Seeley (Megan) of Dalton, Joseph Seeley (Alex) currently stationed in Japan; 5 great-grandchildren, Madison and Mackenzie of Whitefield, Mahleeyah, Jackson , and Lawson of Jacksonville, Fl; and several nieces and nephews. He is predeceased by his parent; 2 brothers, Kenneth Smith and Richard E. Smith; and a sister Sylvia A. Smith. Visiting hours will be held Saturday afternoon, February 9th, from 4:00 to 6:00 PM at the Bailey Funeral Home in Lancaster. "Email Address" would like to share the life celebration of Frederick I. Smith Jr.. Click on the "link" to go to share a favorite memory or leave a condolence message for the family.